This Angel Food Berry Trifle is a no-bake cake and takes very little effort. I literally spent 30-40 minutes putting it together and I was taking pictures. You could probably get it done in 30 minutes, but do let me know if you beat me and set any new records. 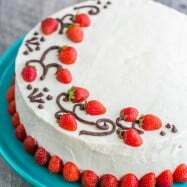 You can even use frozen berries for this cake when they are out of season and too expensive otherwise (heck, that’s what I did and no one knew the difference!). The flavors just zing and pop and wisp your taste buds; it’s basically amazing. 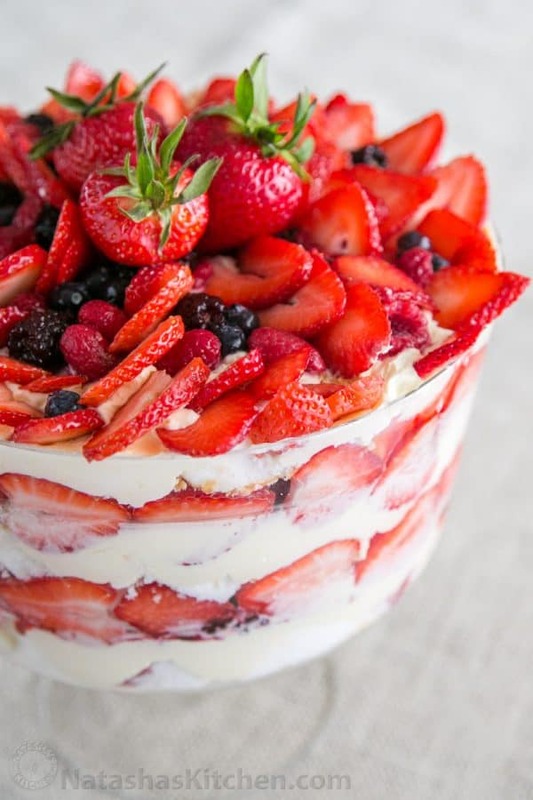 How can’t go wrong with angel food cake, loads of berries and cream. It was a smart move to take this to our worship team meeting rather than run the risk of eating it all at home; yeah it’s that good! My fellow worship team members agreed. It took 6 girls and 5 minutes to eat 3/4 of this beauty. 1. 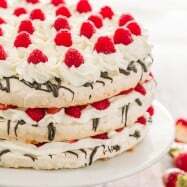 Using electric mixer, beat cold whipping cream on the highest speed for about 3 minutes or until fluffy and stiff peaks form. Refrigerate until ready to use. 2. 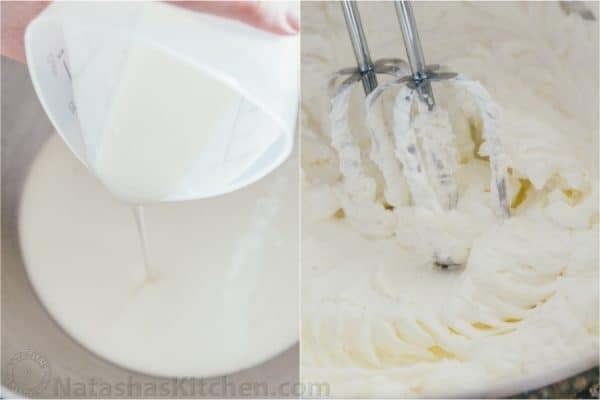 Whisk 1 cup milk together with instant pudding until well blended, then whisk in 1 can refrigerated condensed milk until smooth. 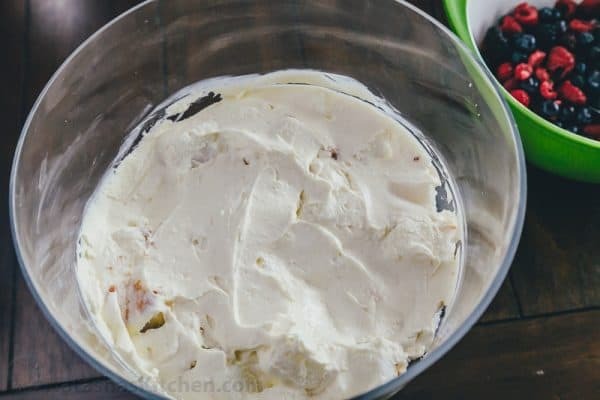 Gently fold in the whipped cream and refrigerate until ready to use. 1. 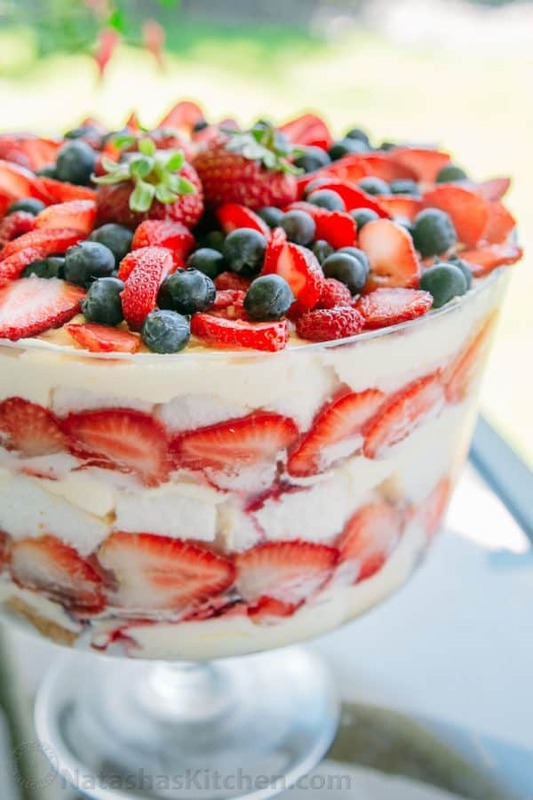 Chop your angel food cake into 1″ cubes and place 1/3 of them into the bottom of your Trifle Bowl. 3. 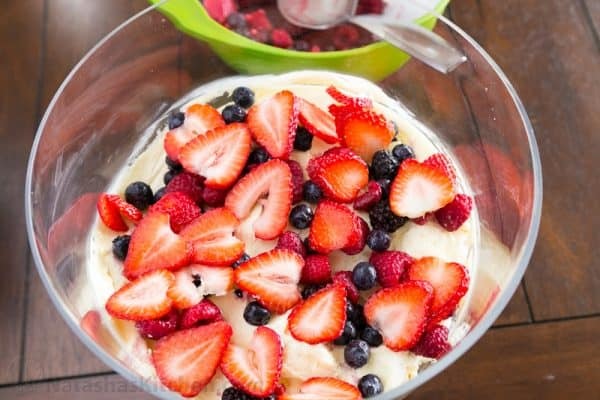 Add 1/4 of your fresh/frozen fruit. I thought it looked pretty to put the strawberries around around on the walls of the bowl, but you can do it any way you want to. 4. Spread a thin layer of glaze over the fruit. 5. Repeat steps 1-4 until you have 3 layers of cake. 6. Arrange your remaining fruit over the top of your cake (you’ll have the most fruit for the top since you’ll probably want to make it look extra fancy) and brush a thin layer of glaze over the fruit (p.s. 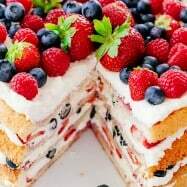 the glaze can be omitted all-together if you are serving the cake the same day, but it preserves and keeps your fruit pretty if you want to serve it the next day. 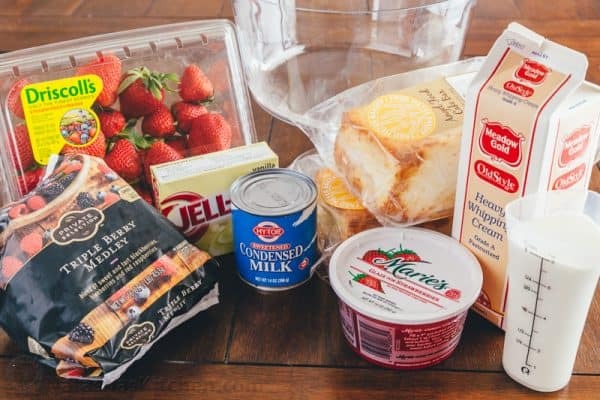 This Angel Food Trifle is a no-bake cake and takes very little effort; done in about 30 minutes! 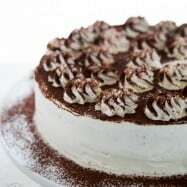 You can even use frozen berries for this cake when they are out of season and too expensive otherwise. The berry glaze is optional if you are serving it the same day but does preserve fruit if you serve it the next day. Ideally, you want to use a Trifle bowl for this recipe. Beat cold whipping cream on the highest speed for about 3 minutes or until fluffy and stiff peaks form. Refrigerate until ready to use. 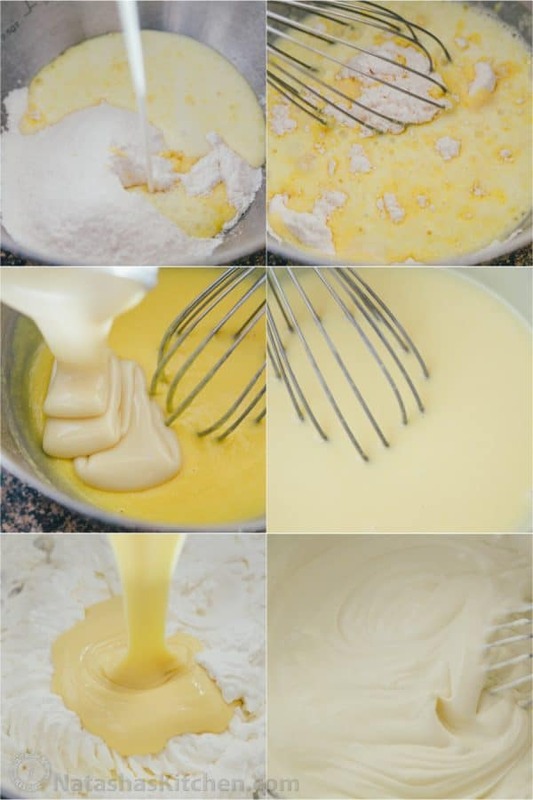 Whisk 1 cup milk together with instant pudding until well blended, then whisk in 1 can refrigerated condensed milk until smooth. Gently fold in the whipped cream and refrigerate until ready to use. 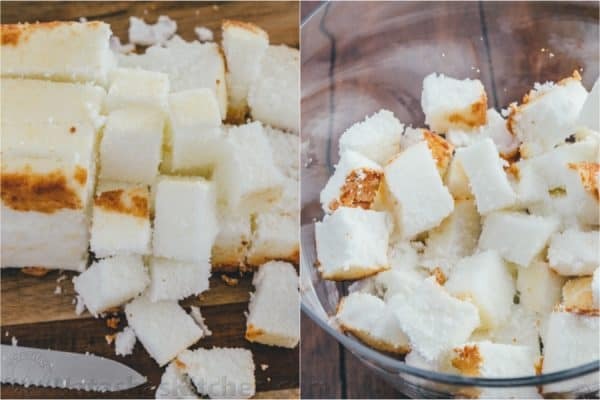 Chop your angel food cake into 1" cubes and place 1/3 of them into the bottom of your trifle bowl. Add 1/4 of your fresh/frozen fruit. 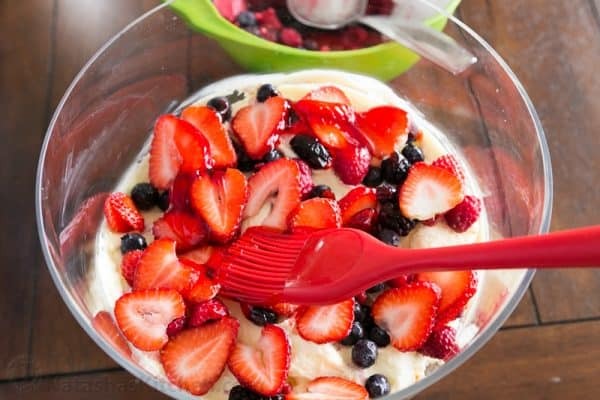 I thought it looked pretty to put the strawberries around around on the walls of the bowl, but you can do it any way you want to. Spread a thin layer of glaze over the fruit. Repeat steps 1-4 until you have 3 layers of cake. Arrange your remaining fruit over the top of your cake (you'll have the most fruit for the top since you'll probably want to make it look extra fancy) and brush a thin layer of glaze over the fruit . 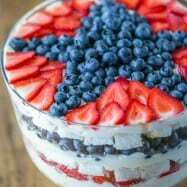 This will be the third time I have made this for a Fourth of July picnic. I made this last year and followed the recipe exactly. I didn’t really like how sweet the condensed milk made the trifle so I’m making it now and used the regular pudding recipe with 2% milk… Do you think if I use that and fold in the whipped cream it will liquefy? Yes, I omitted the condensed milk all together this time and made the pudding with 2% milk. I was thinking of putting it all together tonight for tomorrow night but am concerned about the pudding/whipped cream mixture melting a bit. This was delicious and beautiful and everyone raved about it. There were 7 of us for Easter –half was eaten for dessert and the other half was happily taken home. 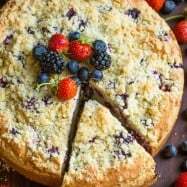 This Triple Berry Angel Food Cake recipe is to die for. I drizzled hazelnut (Frangelico) liquor onto the angel food cake. Do you put frozen berries directly from freezer or thawed? My local grocery store has Instant Vanilla Pudding which only contains 1 oz (NET WT). So do I use five of these packages to be equivalence of the 5.1 oz of the pudding to use in your recipe? И скажите что можно использовать в замен бисквита?? I made it for July 4th. Took it to the park. My family really liked it. I used pound cake…was very good. I cut stars out of the pound cake….but I cut them to thin…didn’t keep there shape. One trick my mother-in-law taught me when whipping heavy cream – put your metal bowl & beaters in the freezer so they are nice & cold, it helps whip up the cream faster. Quick question here: Will the angle food cake hold up if I make the trifle over night and serve it for dessert the following evening? Also, i wanted to add some vanilla pudding and i’m wondering if that will help or hurt the recipe. Can I not use the glaze? Made this for my daughters birthday. It’s really yummy and everyone loved it! Do you think it will turn out different if I use pudding that you cook first? I don’t like buying artificial things. I found a organic pudding mix but you need to cook it first. Also, is there something else that can be used instead of angel cake? man so thankful i found your page, its amazing how many good things u can do. I did this angel cake gosh it was goooood my family came over they all liked it, it was so east to make with all those instructions and pics. Hi! I’m Viki,i’m from Spain. Hi Natashathis looks great and I’d love to try it out but I have NO idea what is Angel food 🙁 … Never heard of it. I live in Germany so things are even more difficult for me to substitute.